The SQF pump is available as a complete unit only. 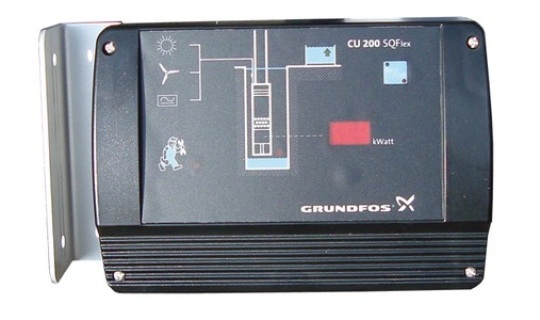 The Grundfos SQFlex system can take DC power straight from the solar panel and be connected to the pump drive motor. The drive motor can handle both AC and DC power supply and the built in motor drive can use these inputs to power the pump. The CU 200 SQFlex Control unit is added to provide a visual display and manual control of the pump. ​Cut-away view of a SQFlex Helical Rotor style pump. Grundfos has developed a PC-based sizing tool enabling the sizing of SQFlex systems. The sizing tool is integrated in Grundfos WinCAPS and covers both solar- and wind-powered systems. • quantity of water required. 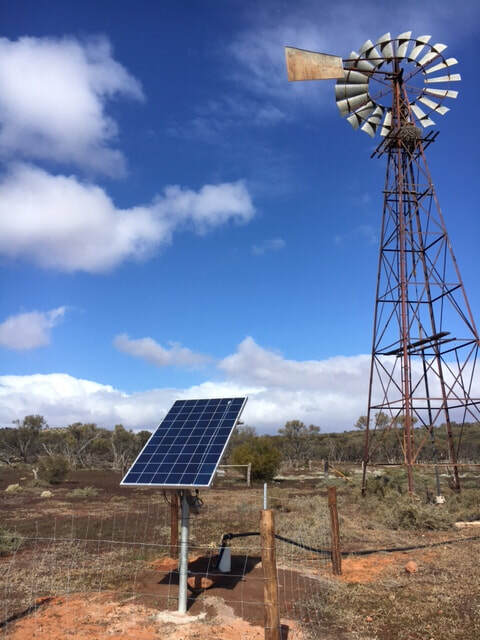 To order a Grundfos Solar Pump System, select the required pump then select the Solar Array to match the pump and your location. Contact us for assistance. Grundfos SQF2.5-2N Submersible Bore Pump in 316SS. Fits 3" and larger water bores. Post Mount Array frame kit complete with - 260 watt PV panels, Array frame, cable guard, IO101 –DC isolator with input for back-up generator and CU200 SQFlex control unit. SQFlex Pressure kit with 32mm Bore Cap, REverse acting Pressure switch, Pressure Gauge 0-10 Bar, 5 way tee and union and 18L Pressure Tank. Excludes submersible cable and pump riser pipe. Available to suit your requirements. SQFlex pumps include dr run protection, over and under voltage protection, overload protection, upthrust and over temperature protection. Available in helical rotor and centrifugal. Full 316 stainless steel construction. 50 metre Crusader Flexibore 100 32mm complete with 1.25" stainless steel end-connectors to suit Grundfos SQF pump and 32mm bore cap. Submersible pump drop cable 6mm2 to suit SQFlex pumps x 55m. 40 metre Crusader Flexibore 100 32mm complete with 1.25" stainless steel end-connectors to suit Grundfos SQF pump and 32mm bore cap. Submersible pump drop cable 6mm2 to suit SQFlex pumps x 45m. Includes Array Frame, Pole, Solar Modules, Cable guards, Plug and Play connections, IO101, CU200 connecting cable and mounting brackets to suit Grundfos SQF range of submersible pumps. Wind Region A: More than 100 km inland from the Eastern Coastline / South of Coffs Harbour (most of NSW & VIC). Wind Region B: Between Bundaberg (QLD) and Coffs Harbour (NSW) and less than 100 km inland from the Eastern Coastline. Wind Region C: North Bundaberg (QLD) and less than 100 km inland from the Eastern Coastline. 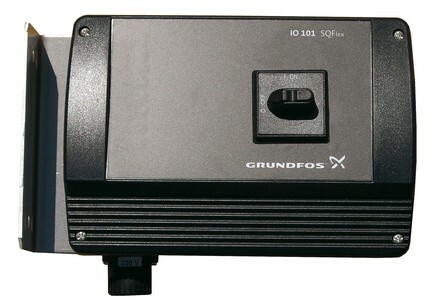 The IO 101 is designed specifically for Grundfos Solar-powered SQFlex systems. The IO 101 enables the connection of a back-up generator in case of insufficient solar energy. In case the generator is stopped manually or runs out of fuel, the IO 101 will automatically change over to the solar panels.The IO 101 functions as a connection box joining all necessary cables. unit especially developed for the SQFlex system. switch or pressure switch to enable automatic tank filling. 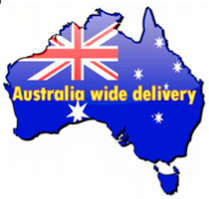 Contact us to confirm your pump selection and freight costs.